In many quarters, hope has long evaporated, but there are some who are holding on, adamant that until they see a body, they won’t believe their loved one is gone. No one now expects to find any of the two men that were aboard the ill-fated five-seater Aero Commander 500S plane that vanished last Sunday evening – alive that is. Rasheed, the Supervisor of American Eagle airlines in Canouan, was the lone passenger on the SVG Air plane when it crashed. “I don’t mind if he has one leg, one eye, or one arm, it doesn’t matter once I get him back, I will get him back,” said Althea, 27, as she grasped the flickering light of hope that the man whom she called “my life” would have been found. Meanwhile Nicha Branker’s hurt and frustration was mixed with steaming rage. Something should have been done sooner to assist her son. Earlier this week Nicha recounted the sequence of events of last Sunday November 19, of what was to be a routine pick up which turned out to be her “worse nightmare”. Nicha, a Trinidadian living in St Vincent told SEARCHLIGHT that at around 6:34 pm she received a call from Rasheed in Canouan, telling her that he was about to board the small airplane to take the customary 13-minute flight to St Vincent. He just got engaged last month and was to be married January 6, 2007. The Catholic Church’s requirement is that the couple attends six pre-marital counselling sessions so he would fly over weekly for the sessions. “I reached at the airport at about 6:55 pm and parked across by C. K. Greaves with the engine on,” Nicha told SEARCHLIGHT. She had grown accustomed him just walking into the car “with his dirty clothes” she said, forcing a smile. When she did not see him, who was the passenger in the plane that was being piloted by Dominic Gonsalves, by a little after 7 pm, Nicha said that she knew immediately that something was wrong. Nicha checked the SVG Air hangar, she reasoned that because it wasn’t a commercial flight that it might have landed and went straight there. She did not find him and was even more convinced that a nightmare had begun to unfold. A former BWIA air hostess who had gone through a wide range of air mishaps, Nicha told SEARCHLIGHT that she knew that time was of the essence if the airplane had in fact experienced difficulties. She called an official of SVG Air and told him that her son was missing on one of their planes and she was dismissed as an over-protective mother; her son was a grown man. That same official called back around 8:30 pm to confirm that something was wrong; the plane was in fact missing and the pilot, Dominic, the son-in-law of one of the owners also could not be found. “Why did it take two and a half hours before they realized that the plane did not land? “Why didn’t the Air Traffic Controllers know that it did not land?” she screamed. She recalled telephoning the leader of the Opposition, Arhnim Eustace, to ask him for the Prime Minister’s after hours telephone number so she could ask him to help speed up things. To her shock and horror, Eustace said he did not know the number. She said that she couldn’t understand how the Opposition leader of a country would not have access to the Prime Minister. She thought that such protocol would be a given.. Meanwhile Althea, two months pregnant, stopped short of making a threat to anyone who would have dared to refer to her fiancÃ© in the past tense. “I can’t deal with that, I can’t think that way,” Althea mumbled as she fidgeted with her engagement ring box. She said that so far, everything that she had prayed for, she got, except for the one time her dog died. Now she wonders, cautiously, not wanting to upset the Man upstairs whether “God failed me this time”. She promised God that she would not ask for anything else if he would bring him back. 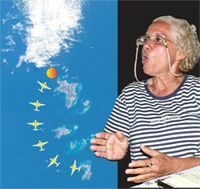 Then there is the expected June 11, 2007 birth of their unborn child, so Althea asked angrily “if it was a LIAT or Caribbean Star plane would it have been ignored like that? Isn’t Rasheed and that pilot people too?” she asked. “I can’t sleep properly, Monday night was the worse,” she said. As she battled with all the “what ifs” and the “perhaps'” she said that Rasheed was looking for work in St Vincent in anticipation of their marriage and the birth of their child. Althea remembers that Rasheed was her best medicine – he made her laugh – and he was an excellent cook. “He loved to cook and when he makes a barbeque it was the best,” Althea said. With every phone call, they hoped that it will turn out like Tom Hanks in the movie “Cast Away”; that they will hear the good news that he had not died but was stranded on some desert island.